Translated into English by Daniel Bogre Udell. Posted on Global Voices on September 27, 2012. 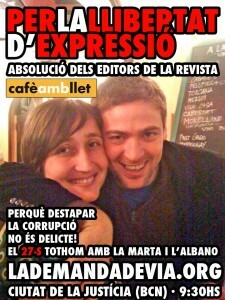 On September 27, 2012 Albano Dante and Marta Sibina, editors of the magazine Cafè amb Llet [ca] of the district Alt Maresme in the Girona province, will face trial in Catalonia, Spain. Josep Maria Via Rodons, president of the Barcelona MAR Health Park Consortium and an advisor to Catalan president, Artur Mas, has sued them for libel following the release of a YouTube video [es] in February 2011 that pointed to alleged corruption in Catalonia’s healthcare system which the Catalan government’s anti-fraud office is now investigating [ca]. In 2010, when government cutbacks in response to the financial crisis began to affect healthcare, the magazine’s editors began investigating the hospital system in their comarca (district), Maresme, which led them to conclusions about the healthcare in Catalonia at large. Eventually, Dante and Sibina produced a map of alleged irregularities in the entire system and links to the some of the region’s major political parties, including the Catalan Socialists (PSC) and the governing bloc Convergence and Union (CiU). As a healthcare advisor to President Mas, Mr. Via Rodons is implicated in the scandal. He is suing the Cafè amb Llet editors for €20,000 euros in damages. Their trial is scheduled to happen before any of the individuals implicated in corruption have been charged. … an another example of the bizarre phenomenon surrounding cases of corruption [in Spain], including the Gürtel and Brugal [es] affairs, in which the accusers go to trial before the accused. After two years of investigating, Dante and Sibina published a series of YouTube videos describing their findings, in both Catalan and Spanish, called El Major robatori de la història de Catalunya or “The Greatest Theft in the History of Catalonia.” The videos explained the web of connections between the public and private sectors of the Catalan healthcare system and accused several senior officials of benefiting from multimillion-euro contracts for their private companies. The video detailed cases like that of Josep Prat, director of the Institut Català de la Salut (Catalan Healthcare Institute or ICS) and director of the conglomerate corporation Innova, or that of Ramón Bagó, president and principal shareholder of the utility group Serhs, who over the last few years has occupied various senior positions at Conscorci de la Salut i Social de Catalunya (CSC), another branch of the healthcare system. A week of litigation could ruin not just the magazine but also its editors, and this led Dante and Sibina to publish a message on their website titled, “We’ve done everything we can. Now we need your help” [ca]. In the wake of silence among Catalonia’s political establishment and mainstream media, we decided years ago to get to the bottom of this. We have found much more insanity than we had ever hoped to find (http://ow.ly/dRqs1%29) [es, ca]. But as we expected, those who have spent the past thirty years getting rich by cheating the people have reacted and are on the attack. Despite these attacks, we’re staying strong. We won’t apologize. Nothing is better than the marvelous sensation of having remained loyal to our conscience. In a few years we’ll be able to look anyone in the eyes and say: “We did what we could” (http://ow.ly/dRrEJ) [es, ca]. Having gotten to this point (http://ow.ly/dRrLS), however, we need help. We can’t face these forces alone. This is why we’re writing to you. On September 27th, at 9:30 AM we will appear in court (http://ow.ly/dRrQT) before any of the individuals implicated (http://ow.ly/dRrYH) in the story we broke (http://ow.ly/dRsba). We need your help to condemn the brutal censorship that stifles us. Therefore, if you can dedicate a few minutes and send this letter to your friends, contacts, local representatives, or whomever you consider, you will be doing us a big favor. Marta [Sibina] and Albano [Dante] employ reason and rhetoric, grasp important details about a seemingly covered-up and out-of-control issue and they have asked the politicians responsible very appropriate questions. Time has passed and they’re still waiting for answers. However, in lieu of those answers, open debate and transparency, all they have received is the grotesque attack by Josep Maria Via, one of President Mas’ senior advisors. We interpret this as a blatant attempt to frighten and silence the voices of dissidents who question the healthcare politics of the Catalan government.